A condensed version of this article appears on The Atlantic’s CityLab. When used judiciously, establishing shots are one of the most useful techniques in film and television. As the curtain opens on a new scene, a director is able to convey a whole range of important information—the when and where of the setting, as well as the overall mood and moment that we are about the enter—all through a single short shot. Such is the power of imagery. Early in the second season, however, these shots take on an entirely new—and quite horrifying—relevance, especially for urban planners who know their history. As the story traces back to the corridors of power in the Fatherland, we get our first establishing shot of the Nazi capital of Berlin, looking east past the famous Siegessäule (Victory Column), towards the Brandenburg Gate. Spanning the horizon as the spine of the new imperial capital runs the three-mile long Prachtallee (Boulevard of Splendors; shown in Figure 2, looking north). At the south, the massive Triumphal Arch, intended to be over 100 meters high, large enough to fit over Paris’s Arc de Triomphe; to the north, along the Spree River, sits the heart of the Reich, an immense domed structure to be known as the Volkshalle (People’s Hall). In some versions of the plans, rather than spanning the Spree, the river itself was to be relocated—like the Victory Column—to accommodate Speer’s vision. Although never built, Speer’s monster-piece (indeed, some dubbed it the “Monsterbau,” or monster-building) truly puts the “dominate” in “dome”: looking like the US Capitol on steroids (or perhaps Nazi Pervitin), it would have been large enough to fit the Papal Basilica of St. Peter inside it. Hitler planned to use the massive hall to gather crowds of up to 180,000 people—what would have been by far the largest interior assembly space in the world; planners fretted that the respiration from so many excited Nazis in a single enclosed space might create its own weather patterns. (The Volkshalle figures prominently in the second season, and the interior was painstakingly recreated for the show as well, as discussed in this article on io9). In a nice touch, given that the show takes place in 1962, a full 15 years after the war, the team updated Speer’s vision slightly: after all, time marches on even in the alternative past. Running straight through the main establishing shot, and visible in other scenes as well, a clean and modern monorail whisks people above the city, like something out of “Wald Disney Welt’s Morgen-Lande.” (Some might object to the placement here: the tracks nearly graze the Victory Column, upsetting the delicate symmetry of the design; when necessary, Speer preferred to put transport, infrastructure, and even pedestrians underground and out of view.) Other shots depict cranes, busy building on the ever-expanding horizon, and later in the season we are treated to a pitch for the Reich’s plans to dam and drain the Mediterranean Sea (an idea also found in the book, based on a real-world scheme known as Atlantropa promoted by the German architect Herman Sörgel). “Make no little plans—they have no magic to stir men’s blood,” it would seem. 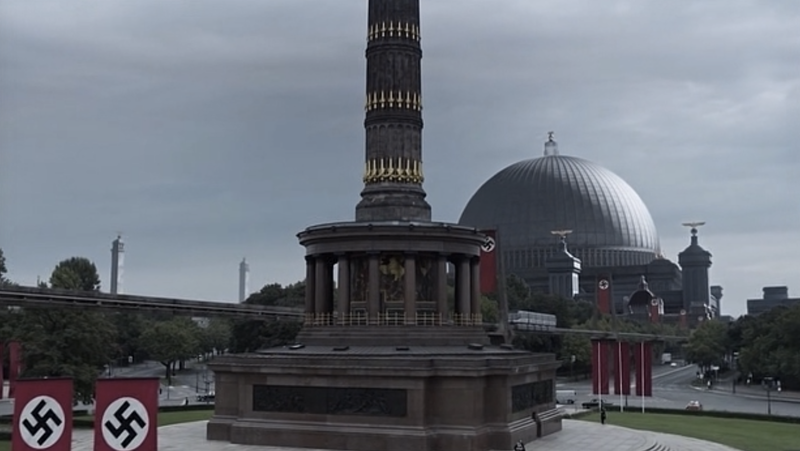 Figure 3: The Siegessäule and Volkshalle, with monorail; from “Man in the High Castle,” Season 2. But pause the show for a moment (use the space bar—it’s a shortcut): now is the time in the article when we need to stop admiring all these impressive designs and instead reflect on what we are seeing and what it really means. For starters, to conclude that Speer devised ambitious, albeit unimplemented, plans for the improvement of Berlin would be a dangerous mis-characterization, in two ways. Firstly, he did not so much envision “fixing” Berlin as utterly destroying it and rebuilding a new city in its place, like a Phoenix rising or some similar deranged Nazi metaphor. As Hitler plotted to destroy the world in order to usher in a new Third Reich, Speer made plans for a total war on the city and people of Berlin in order to achieve his perfect vision. Secondly, it would be wrong to conclude that Speer only planned this assault. Although he constructed little, he spent years making destructive “progress” in the early stages of his scorched-earth campaign. In 1937 Hitler named Speer General Building Inspector for the Reich Capital and granted him extraordinary powers, which he used to demolish entire neighborhoods and forcibly relocate thousands of residents at a pace that would have made Robert Moses jealous: urban renewal on an insane scale. Jewish families were moved to concentration camps to make room for other dislocated Berliners whose homes were bulldozed, in a sickening game of cascading misery. All urban planners have a responsibility to remember these aspects of the master-builder’s tenure, and to be aware of the sad parallels with our own planning history. So complete were Speer’s plans for destruction that he would joke, when Allied bombers had a particularly successful night, that they were doing his job for him. Had Germany’s eventual loss not occurred (and the city’s underlying sandy soils been more conducive to supporting his proposed buildings—he still had some technical issues to work through), he would surely have demolished even more of the old city, including the Reichstag and the Brandenburg Gate. Architects and urban planners who have analysed [Speer’s planned] city in recent years claim it would probably have been nightmarish to live in: hostile to pedestrians, who would regularly have be sent underground to cross streets, and with a chaotic road system, as Speer’s did not believe in traffic lights or trams. Citizens would have been made to feel variously impressed and inhibited by the towering structures around them. Even more chilling, Speer actually contemplated the destruction of his own beautiful creations 1000 years in the future, expounding his Ruinenwerttheorie–a “theory of ruin value”—for the architectural monuments he designed, a sort of perverted death-cult in stone, the city as mausoleum. But perhaps we need to feel the shock and try to push back on the awe: even if these structures are glorious, do we endorse the beliefs they embody? And is it possible to separate the two? Just as is true for the music of Carl Orff and the films of Leni Reifenstahl, Albert Speer’s architecture is inextricably linked to fascist ideology—and this is more than just guilt by association. In all three these cases, the artists may have been masters of their respective crafts, but their crafts were designed to unleash extremely powerful emotions and used to incite equally dangerous actions. The techniques and tools they perfected are incredibly effective: they seem to have hit upon certain universals rules of aesthetics—certain ideal forms—that just work. Even more problematically, the techniques of fascist architecture (or music or film or graphic design) may in fact be so powerful that they transcend history and even geo-politics: this is not just a “Nazi problem” we can relegate to the past. These tools work for fascists, but non-fascists are tempted to use them as well. As Dietmar Schirmer has noted, much of the best architecture from the period—whether in Berlin, Paris, or Washington, DC—employs the “Stripped Classicism” favored by Speer. (Schirmer also cites the more recent controversy over the WWII Memorial on the Washington Mall: some critics charge that in attempting to capture a “1940s style,” the designers have essentially created a “fascist-looking” American memorial.) Further complicating the story, the influence actually runs in multiple directions: in addition to admiring Haussmann’s Paris and classical Rome, Speer was a big fan of L’Enfant’s monumental plan for Washington, DC—so where are the roots of the problem?. As an antidote to Speer’s visions and “Man in the High Castle,” I recommend a palette-cleansing viewing of Walther Ruttman’s 1927 film, Berlin: Symphony of a Great City, which showcases Weimar Berlin, before Hitler. Sadly, the delightful cuckoo-clockwork city he depicts was doubly destroyed by both sides during the war—but we can still speculate about this alternative world that wasn’t, a more pleasant alt-alt-history. This entry was posted in Non-Documentary, Reviews by eglenn. Bookmark the permalink.